J.J. Thomson in 1904, proposed that an atom was a sphere of positive electricity in which were embedded number of electrons. The stability of the atom was explained as a result of the balance between the repulsive forces between the electrons and their attraction towards the centre of the positive Sphere.This model is compared with a watermelon in which seeds are embedded or with a cake or pudding in which raisins are embedded. That is why this model is called as raisin pudding model a watermelon model. Rutherford in 1911, performed scattering experiment in which he bombarded thin walls of metals like gold, silver, Platinum or copper with a beam of fast moving Alpha particles.The source of Alpha particles was radium, a radioactive substance, placed in a block of lead.Slits were used to get a fine beam.The presence of Alpha particles at any point around the thin foil of gold after striking it was detected with the help of a circular zinc sulphide.The point at which an Alpha particle strikes this screen ,a flash of light is given out. 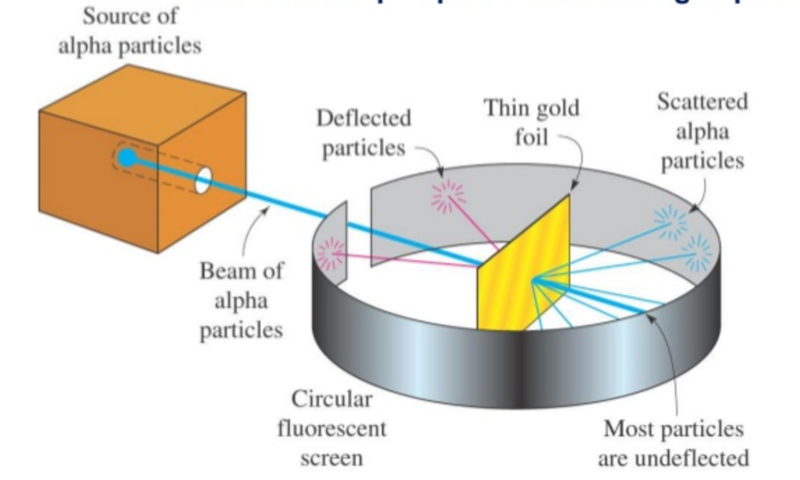 1)Most of the Alpha particles passed through the foil without undergoing any deflection. 2)Few Alpha particles underwent deflection through small angles. 1)Since most of the Alpha particles passed through the foil without undergoing any deflection, there must be sufficient empty space within the atom. 2)Since few alpha particles were deflected through small angles and alpha particles were positively charged particles, these could be deflected only by some positive body present within the atom. The alpha particles deflected were those which passed very close to this positive body. 3)Since some alpha particles were deflected back and alpha particles are heavy particle, these could be deflected back only when they strike some heavier body inside the atom. 4)Since the number of alpha particles deflected back is very very small, this shows that the heavy body present in an atom must be occupying a very very small volume. The small heavy positively charged body present within the atom was called nucleus. (1) Nucleus is very small in size, carries positive charge and in which the entire mass of the atom is concentrated. (2) Since electrons have negligible mass ,the mass of the atom is mainly due to protons and neutrons. (3) Protons and neutrons must be present in the nucleus. (4) Extranuclear part is the space around the nucleus in which the electrons were distributed. An atom consists of a small, heavy positively charged nucleus in the centre and the electrons were revolving around it. This model was compared with the solar system in which the planets were revolving around the sun and continue to move in their fixed circular paths because the force of attraction was balanced by the centrifugal force. According to Maxwell’s electromagnetic theory, whenever a charged particle like electron is revolving in a field of force like that of the nucleus, it loses energy continuously in the form of electromagnetic radiation. This is because when a particle is revolving, it undergoes acceleration due to change in direction even if the speed remains constant.Thus, the orbit of the revolving electron will keep on becoming smaller and smaller, following a spiral path and ultimately the electron should fall into the nucleus.The atom should collapse. Rutherford model could not explain the stability of the atom. (2) Inability to explain the line spectra of the elements. (3) Inability to describe distribution of electrons and energies of electrons. Atomic number is also known as Proton number because the charge on the nucleus depends upon the number of protons. The mass number is represented by A. Where A is mass number, Z is atomic number and X is the element. Atoms of the same element having same atomic number but different mass number. Atoms of different elements having different but same mass number are called isobars. Atoms of different elements which contain the same number of neutrons are called isotones. The species containing the same number of electrons are called isoelectronic. Of An Atom – Chemistry, Class 11, Structure Of Atom is a little vanilla.